Have you prepared your home for the winter? With colder temperatures starting you’ll need to spend an hour or two getting your home ready to deal with the possibility of harsher weather and below-freezing temperatures, depending on where you live. Let’s take a look at a few quick home maintenance tips that will help you get your house ready for the cold of winter. Your roof is one of the most important structural elements in your home and one that is going face the brunt of any inclement weather that passes through your area. If you feel comfortable on a ladder, climb up and quickly inspect the roof for damage or missing shingles. 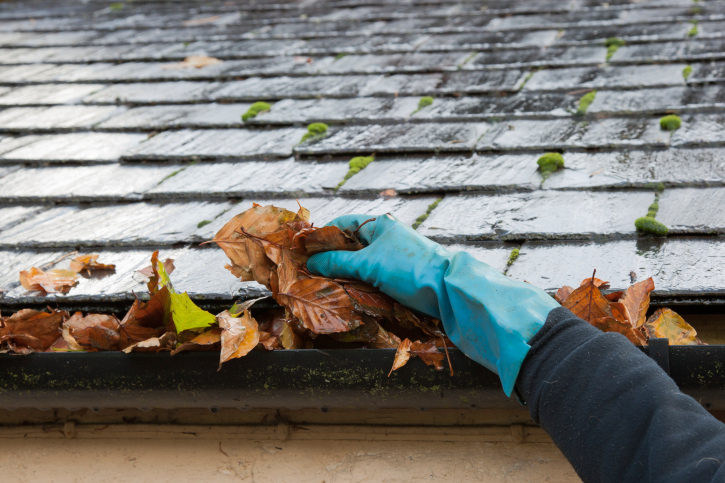 You’ll also want to clean the gutters and drain spouts, removing leaves and other gunk so that water can flow freely from your roof to the ground. If you have exterior faucets and hoses you’ll need to flush out and drain any remaining water before storing them away for the winter. In-ground irrigation systems should have an anti-freezing treatment performed by a professional as freezing can cause a significant amount of damage to pipes and outlets. Leaky windows and doors can cause your heating bill to skyrocket, so spend a few minutes going around the house to inspect seals and frames to see if anything is leaking. Pay close attention to any single-pane windows as leaks can appear over time due to expansion caused by temperature fluctuations. It takes just a few cents worth of caulking to save many dollars in wasted heat. Finally you’ll want to ensure that your air conditioning unit has been fully shut down and properly stored. If you have an in-ground unit, you’ll also need to cover it to protect it from rain, snow and wind. If you use a furnace to heat your home, be sure to clean or replace its air filter and consider firing the entire system up so you can check the ducts for leaks. These home maintenance tips will help keep your home in peak condition and prevent damage that can reduce your resale value. If you’re thinking about selling your home, give your local real estate agent a call and they can assist you with getting the process started.